I met Yohalakshmi at her house early on a Monday morning. She is a resident of a village called Thandalaputhur, also known as T.Puthur, some 50 kms from Tiruchirappalli. 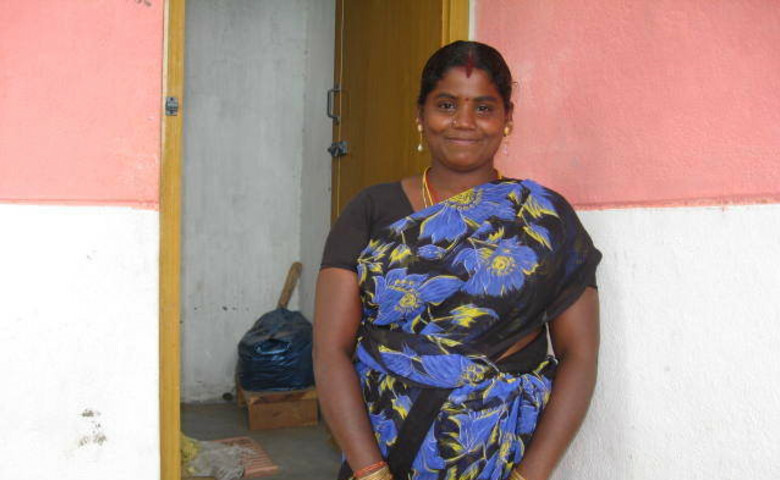 It's been 14 months since she's taken the loan from Guardian to build a toilet in her house. She has four more months of making the monthly payment of Rs.650 towards loan recovery. She is twenty-two years old with a six months old baby. Her husband renders cement for a construction contractor. Their monthly household income is close to Rs.5,000. The toilet is almost constructed with just two months left to being completed, since funds were insufficient and they've been putting together the total amount required for over two years now. They've been using the open fields around their village to relieve themselves. They have to endure atleast a kilomenters worth of walk every time they need to use the fields. When she found out about the microfinance loan being provided by Guardian to fund the construction of toilets and water connection, she decided to avail it. She hopes in two months her sanitation issues will be resolved and her family will be able to lead a healthier life.